Recently Shutterfly offered bloggers 50 free Shutterfly cards if we'd write a post about some of their products. I did, and my cards have arrived. In fact, before that offer I had attended a House Party and we got codes for free photo books. 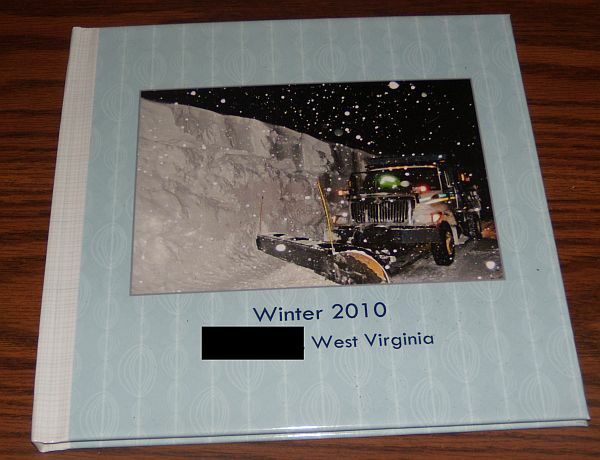 I made a photo book for my cousin of the snows we had last winter. 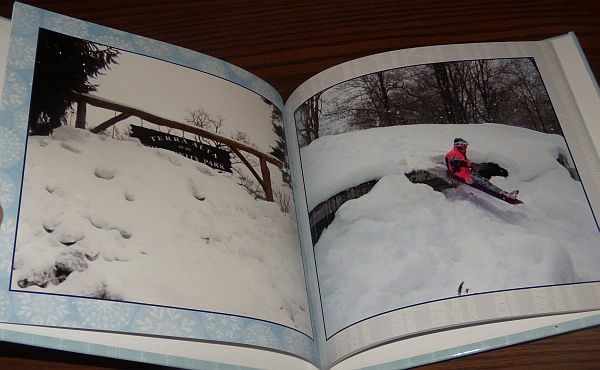 I was able to personalize it and even put some photos in the book of his house and business during our blizzards last winter. I'm really dreading winter because all I can think about is last winter. But winter will come even if I don't want it to, and I might as well use some of the photos to make a book about the winter we'll talk about for years to come! I had a code for five free cards, and I have a handful of Jewish friends and don't feel like I should send them a card that says Merry Christmas. For a number of years I went with a more generic "Happy Holidays" but decided last year to revert back to "Merry Christmas". The year I had visited Israel, I sent along photos of me at Bethlehem with my Christmas letter and me at the Western Wall with my Hanukkah letter, so I try to do something very similar for both greetings when I don't do a "holiday" card. 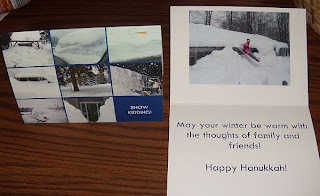 These are my Hanukkah cards this year (which I must get out soon as Hanukkah starts at sundown on December 1!) There are 8 snow photos on the front of the card, and the bottom corner says "Snow Kidding" The inside has another snow photo and says "May your winter be warm with the thoughts of family and friends! Happy Hanukkah!" Because I got free Christmas cards last year and never mailed them out, nor did I mail my Christmas letter from last year, I decided that because the cards I got last year are a little dated (me in front of the Church of the Saviour on the Spilled Blood in St. Petersburg Russia) and I can't exactly use them another year, I'm going to mail both cards this year. 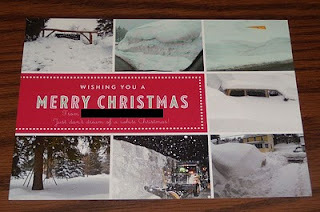 For that reason I chose a flat card from Shutterfly as my Christmas card. Part of the reason is I hope to keep TWO Christmas cards and TWO letters under one ounce. As verbose as my Christmas letters tend to be, this may prove to be difficult! I chose one where I could add seven photos. It says "Wishing you a Merry Christmas From (us) Just don't dream of a white Christmas!" Let me point out here that the photo to the right of Merry Christmas is our next door neighbor's van. I took that out of an upstairs bedroom window last year. The day before the van had been driven, but we had a "snow hurricane" in the night, and we had tons of snow dumped on us. As always, I'm highly pleased with the quality of the items offered by Shutterfly. As a bargain hunter, paying full price for their items is not something I would likely do, however, they often have sales, free card offers, etc. and as always, I very much enjoy ordering from Shutterfly.